Having fun with customers or employees can be very good for business. But what do you do if you don’t always have time for golf? Pivot’s Pick-It technology is a great way to engage them in a compelling way. How? Our easy-to-use platform allows you to run online competitions with your branding and information. It’s a better look and a superior experience than what you get from the massive media companies. You can run a contest with customers and prospects to grow your business or you can have a great time with your team through an employee contest. 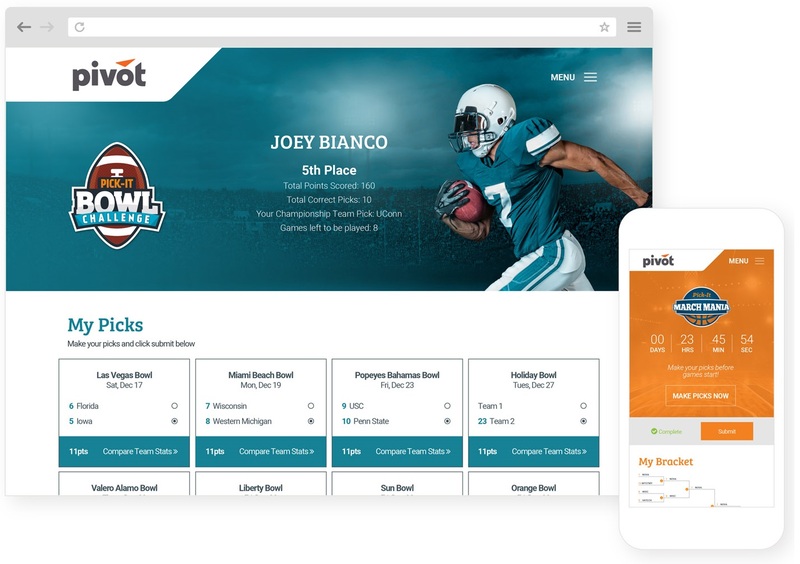 The Pick-It Bowl Challenge lets participants select the winners of the college bowl games in December/January, earn points based on their picks, and win prizes. The Pick-It March Mania includes an interactive bracket that lets participants choose from the 64 teams playing in the college basketball tournament. In both cases, participants are having a blast as they interact with your brand and marketing. We do all the work to make you look good. of participants want to play again. said Pick-It was easy to use. of participants say their opinion of the company that hosted the contest improved by playing. If you are looking for a low-cost way to engage your customers, prospects or employees, please get in touch. We’d love to share more about this effective tool.